This realistic looking full color basketball sits on an antique gold pedestal and is mounted to a black plastic weighted base. The ball itself can be autographed with a Sharpie pen, and the base can be personalized to make a great award or gift. The basketball is also available in metallic gold or silver. 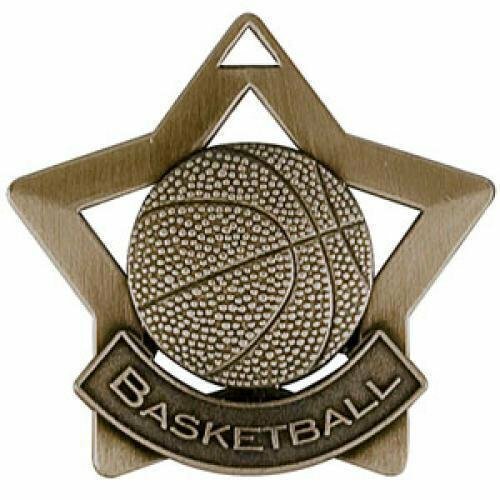 The Innovative new 3 1/2" Basketball Stadium Award medallion is the world's first Athletic medallion that doubles as a stand-up trophy. Available in antique gold finish with a bottom support bar that can accommodate an engraved plate or flexi brass. Star Resin Awards are well designed, stand-alone awards which feature a variety of themes in antique finish. Available in 6"& 8" sizes. Plate Not Included. Available for several sports , with a blank star, or in plain black to add your own design, these black and silver dog tags can be personalized to be used for a keychain, bag tag, or worn on a neck chain. The Basketball Star Dog Tag features a basketball framed by the silver star. The Star Dog Tags make a great gift for members of your team or organization. 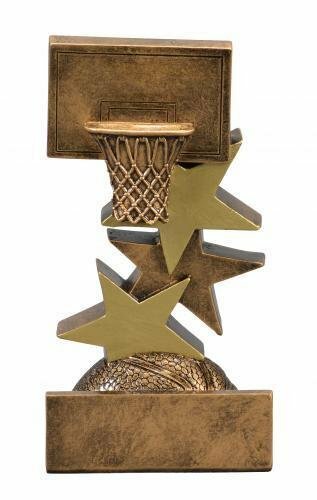 This basketball star step award is a great choice for your next awards banquet. Basketball icons like a backboard and basketball are interspersed with stars that flow from the base to the top of the award to complete this unique look. The Star Step line is available in other sports and or activities. Standing 5 1/4" tall the base on these awards provide plenty of room for whatever your personalization needs may be. 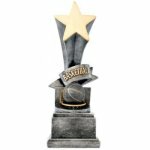 These Basketball Star Storm Awards are a great choice for your next awards banquet. A swirling design starts from the base and continues upward to a free form star while a full color basketball in the middle of the award completes the look. These Star Storm awards are available in other sports and your choice of 6", 7" or 8" tall. 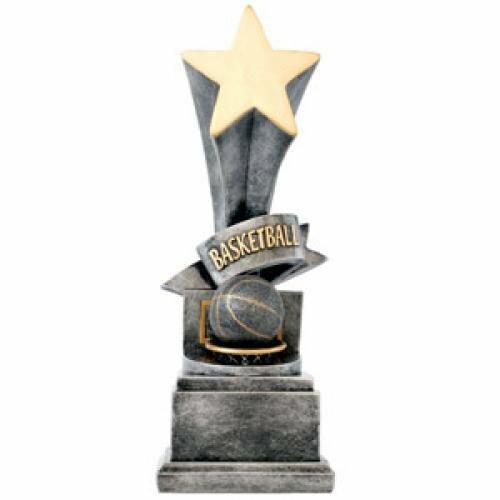 The unique triangle shaped base on these awards provide plenty of room for whatever your personalization needs may be. These awards are sure to be a slam dunk! 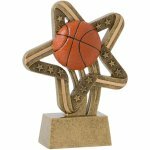 Stars swirl around a highly detailed basketball and net in the center of this Basketball Star Swirl award. The spped lines of the stars creates a dynamic sense of movement to this line of awards. The award stands 5 1/4" tall with an antique gold finish. The base has plenty of room for whatever your personalization needs might be. 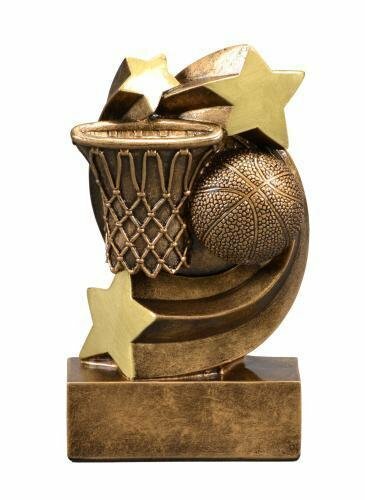 This is the perfect award for any basketball participant. Stars & Stripes Resins feature scholastic and sports themes which are super for schools and sports programs. Brilliant colors highlight this unique basketball street tag. The street tags are on a highly polished black finish. Set in the center of the tag is an outline of stars with red flames that are set behind an orange basketball with black lining and the word "Basketball" on opposite sides completes the award. This item measures 2 1/2" X 1 1/2" so it has plenty of room on the back for what ever personalization you require. 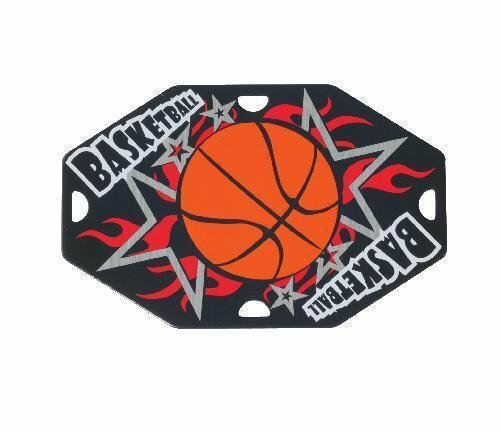 The basketball street tag can be given as either a key chain or a neck worn award providing you the ultimate in flexibility.